1 Is the Proform 505 CST Treadmill Suitable For You? 4 How much weight can it handle? 6 Is the Proform 505 CST motor powerful enough? Is the Proform 505 CST Treadmill Suitable For You? 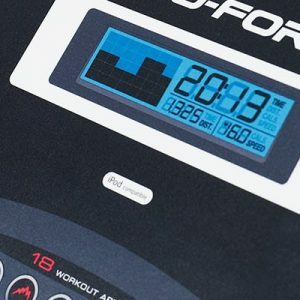 This is more than just a review for the Proform 505 CST treadmill: We find out whether it’s suitable for your needs and if it’s worth spending your money on. To make exercising much easier, you need a quality treadmill. Having a treadmill at home allows you to exercise whenever you have an opportunity. For busy, hardworking people, that might mean squeezing in a quick 20 or 30-minute workout on weekdays, or going for an hour or longer whenever you can find some “me” time. Although there’s a wide range of treadmills available, it’s best to go with something that is stable, yet affordable. I don’t recommend a portable treadmill as your primary piece of exercise equipment for that very reason. They’re just not up to the challenge of daily use. At the other end of the spectrum and the commercial quality machines that cost a fortune. Instead, what I suggest looking at is something in the middle. The best treadmill I found that fits the criteria would be the Proform 505 CST treadmill. Proform has been making treadmills for a long time and many customers own units they’ve used for 5 to 10 years – or more – in some cases. The 505 CST makes an excellent treadmill. It offers a stable base with full functionality at an affordable price. It’s worth checking out for yourself. But before you do so, I want to let you in on what I’ve discovered about this model. You can make the most out of limited living space. What the 505 CST enables you to do is basically reduce by about 50% the amount of floor space a standard treadmill would permanently occupy. This is achieved by folding the treadmill up when it’s not being used. The reasonable price of the Proform 505 CST puts it within the reach of those of us with young families. Typically, it’s priced around the $600 mark and at that price you’re getting a lot of machine for the money. It’s a mid-range treadmill. In other words, it’s not the most basic and it’s not a deluxe model either. The Proform is built on a solid steel frame, has adjustable speeds and inclines and is quite a durable unit. So unless you’re training for the Olympics, the 505 CST should deliver multiple years of steady service. It’s relatively quiet to operate, although that depends on how light or heavy footed you are. If you’re in an apartment with neighbors directly below, they’re likely hear every step you take on the treadmill. But that’s the way it is with any treadmill. There’s just no way around it if you’re moving with authority and purpose when you step onto the platform. One way to help minimize the noise generated is by using a thick rubber mat under the machine. But it’s difficult to completely avoid noise that’s transferred through the floor. Many have stated that the 505 CST delivers a solid performance consistently over time. I personally use my treadmill to walk 5-6 miles a day, Monday to Friday and this routine has had a positive impact on me. I feel lighter, happier, more energetic and more alive. And I owe it all to the decision to get a treadmill and actually use it. 2.5 CHP (Continuous Horse Power) Mach Z commercial motor. This dependable motor stays cool even during challenging workouts. It’s proven itself enough that the manufacturer can confidently offer a 25-year warranty. 0 to 10 MPH settings with quick speed controls for both manual and automatic adjustments. 0 to 10% incline. An incline helps convert an easy walk into a serious workout. These powered adjustments mean it’s effortless and automatic to step up to a higher incline and burn more calories. 1.9 inch (mid-size) balanced rollers help reduce tension and wear and tear on the bearings. This better grip for the track, while making the machine less noisy. Maximum floor space this unit occupies is 36″ x 73″. When in the upright position it measures approximately 68” tall. The large LCD display makes it easy to monitor distance, speed, calories burned, heart rate, and workout time. With an iPad (and other MP3) compatible port and built-in sound system, you can listen to your favorite music as you walk your way to better fitness. This unit comes preloaded with 18 workout apps. That means you get workouts by a personal trainer at the touch of a button. There’s enough variety here to provide something for everyone. There’s a lifetime warranty on the frame, 25 years on the motor and 1 year on parts and labor. So you get automatic protection from a reliable manufacturer – right out of the box. The heart rate monitor provides a real-time measurement that allows you to check your pulse whenever you want during your exercise period. Weight capacity of the Proform 505 CST is up to 325 pounds per user. I wouldn’t recommend this model if you weigh more than about 250 pounds. You may be fine, but that’s probably pushing it for something you’re going to want to use every day. You’d be safer with a larger treadmill. The tread belt dimensions (deck area) are 20″ x 55″. This gives enough room for longer strides, with enough upper body room to be comfortable. A space-saving design allows the unit to basically fold in half upwards when not in use. Cushioning of the entire deck area provides more comfort and less stress on your feet, ankles, knees, and hips – making longer workouts easier, with faster recovery times. The base of the 505 CST treadmill sits about 8 inches off the floor. The unit runs on 110 V circuit making it usable in any household three-prong outlet. 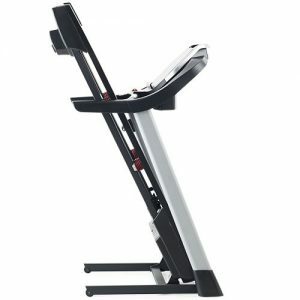 Having an incline makes a huge difference in the fitness benefit offered by treadmills. Even a slight increase of just 1% can help. This setting makes your walking more like outdoor walking or jogging due to any uneven pavement encountered as well as wind resistance. Higher inclines allow you to tone better as you naturally burn more calories. Is the Proform 505 CST motor powerful enough? When shopping for a treadmill you need to be aware that there are two different types of horsepower – standard (HP) and continuous (CHP). Standard horsepower measures the peak capability of the motor. Peak levels cannot be maintained, so this data is not very relevant. CHP, on the other hand, is sustained horsepower and therefore is much more representative of performance. 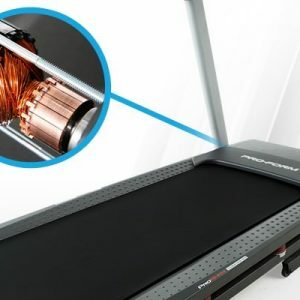 With a 2.5 CHP motor, the Proform 505 CST treadmill has about as much as power as the average home can handle on a standard 15 or 20 amp circuit. While there are manufacturers who offer 4 CHP, only the most serious athletes would ever need a 4 CHP motor. But they might need to change their home’s wiring to accommodate the larger unit. 2.5 CHP is more than enough for 99% of treadmill users. It’s well-made, sturdy and offers a smooth tread surface and transition when changing the incline. Quick speed change buttons are right there in front of you and are easy to operate. Compared to competitors, this machine is quiet, particularly at lower speeds. The LCD display provides a quick at-a-glance record of the total calories burned, distance walked, and time invested on the treadmill. It’s gratifying to see what you’ve accomplished as you wind down another exercise session. There are two pockets to hold a water bottle or electronic device. Traction is solid and steady. Simple controls make it easy to use, while the automated speed changes are excellent for more intense workouts. Built-in shock absorbers help ease the stress on the body’s joints. Minimal assembly is required. For some, that’s still too much. It’s not that difficult, but it can take time. You could always hire someone to put it together for you. It’s the best value treadmill around, making it a strong candidate as an entry-level or “starter” model. Floor space saved is helpful, though it’s not as much as some buyer expected. Folding the machine up only about reduces the floor space it occupies by about half. Folded, the 500 CST measures approximately 31 inches long, so it’s not as compact as some customers would like. Some people find it difficult to put the unit together. But it’s basically like assembling IKEA furniture. If you’ve done that before, this is no big deal. Just like any well-made treadmill, this one is a heavy machine and therefore not easily movable. Shifting it around and into place can be difficult – particularly for people with smaller frames. There’s no hydraulic drop-down system when lowering the treat from a closed storage position. So this may be too heavy for some people to do alone. When it doubt, always get someone to help. For the vast majority, the 505 CST would be useful. But it’s not an ideal treadmill for heavier people, despite any such claims. There’s no fan attached to cool you down as you sweat. But you can always pick up a clip on fan that will do the job. It takes up considerable floor space – every treadmill does. But the Proform doesn’t take up as much space as some machines do. Be sure to install your new treadmill on a level floor. This ensures less vibration and noise. Set up your treadmill on a thick rubber mat – the thicker the better. it’s also helpful if the floor is carpet rather than hardwood or tile. Allow plenty of time for assembly. It’s easiest with a relaxed approach – and a helper. After all, there’s no rush. Some people are able to put it together in less than an hour. But it’s best if you can allow yourself at least three hours to complete the job. I recommend laying out all the pieces first and reading the instructions before you begin to assemble. If you’re locating your treadmill on a different floor, don’t try carrying the full box to the other floor. Instead, break it open and move the pieces one by one. It’s much easier that way. It’s best to set up your machine in the exact area that it’s going to be used. All treadmills (other than the smaller portable ones) are large, bulky and often awkward pieces of equipment to move. While it’s helpful if it folds – and this model certainly does – it still a challenging piece to move about as you rearrange your room. It’s also recommended that you keep a can of WD-40 handy. As you begin to break down the packaging, there are a couple of stubborn screws that need to be removed. WD-40 takes care of this problem quite easily. The Proform 505 CST offers superb value in a solid treadmill with a proven track record of performance. It’s powerful, yet easy to use, eliminating any excuses you might have had in the past for not exercising. For the price, you just won’t find a better treadmill. We happily recommend this treadmill. 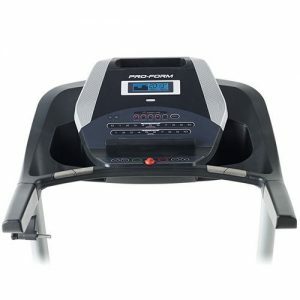 For the best deals on the Proform 505 CST Treadmill, click below.